Receive a special invite to our Facebook Group Today! Bon Jour!! 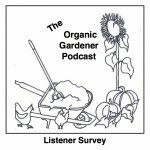 and Welcome to episode 170 of the Organic Gardener Podcast Today!!! 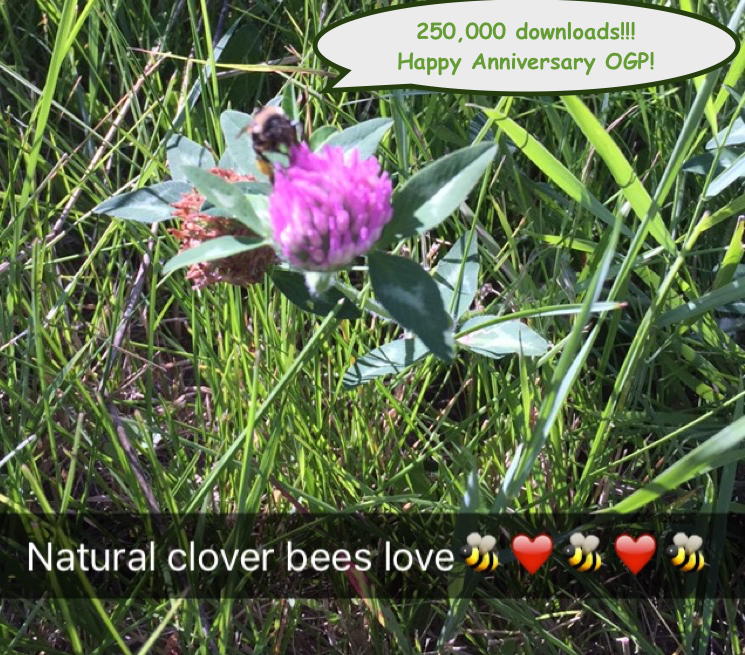 I AM JUST THRILLED to introduce my guest because not only are we about to break 250,000 downloads of the Organic Gardener Podcast yes, thanks to all of you amazing green future growers listening out there that’s one quarter of a million downloads, very likely as we speak this morning January 12, 2017! But way back in episode 45 Joyce Pinson from Friends Drift Inn. 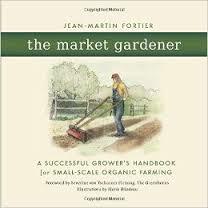 recommended the award winning book the Market Gardener: A successful Grower’s Handbook for Small Scale Organic Farming by JM Fortier who is revolutionizing the way we think about agriculture, small scale farming and most of all how we care for our planet and today he his here with us to share his knowledge and his incredible passion! So I know you are as excited as I am to hear him speak so welcome Jean Martin Fortier!!!! 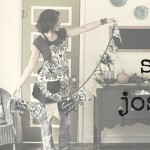 You have to check out the pics on his website http://lagrelinette.com/visite-des-jardins/ and the videos on youtube. First of all I’m French-Canadian, I live in Quebec Canada! I have a micro-farm with my wife, we’ve been farming there for almost 15 years … it’s a real special farm, because it’s kind of big and small! It’s a small commercial farm, compared to other CSA production farms. We cultivate about an acre and a 1/2 that’s about the size of soccer field! But by using the techniques and tools we are able to generate enough income to be living from that acre and half. We feed more then 250 families, we do a CSA and we go to farmer’s market! We do specialty crops for certain restaurants and the local community for our grocery store! The farm is in operation for a while! I guess I can say it that way, I guess my claim to fame is that we have been proving that a farm doesn’t need to be big to be very profitable. 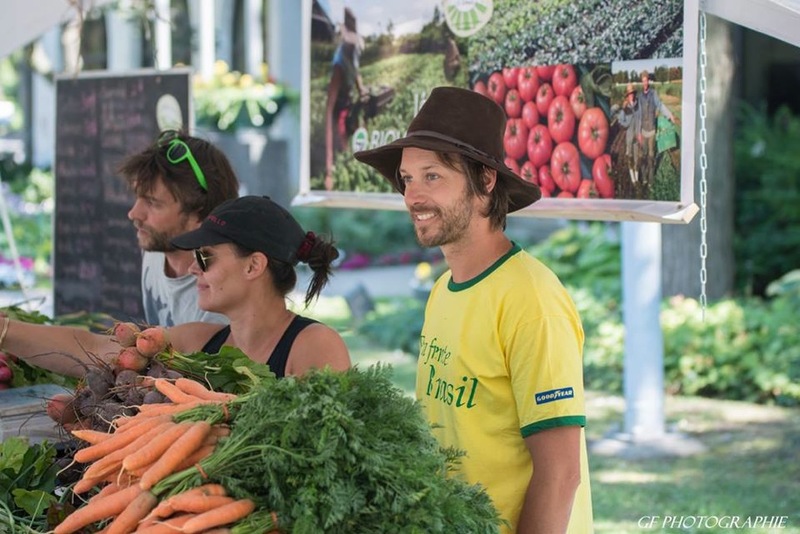 You can use hand tools and low tech gardening strategies to grow commercially and make it happen yourself, all while the community with nourishing food! I think that’s a perfect introduction. Your farm is … Im not gonna try to say it in french because I’ve struggled with french for years. It’s named after the broadfork is that right now? 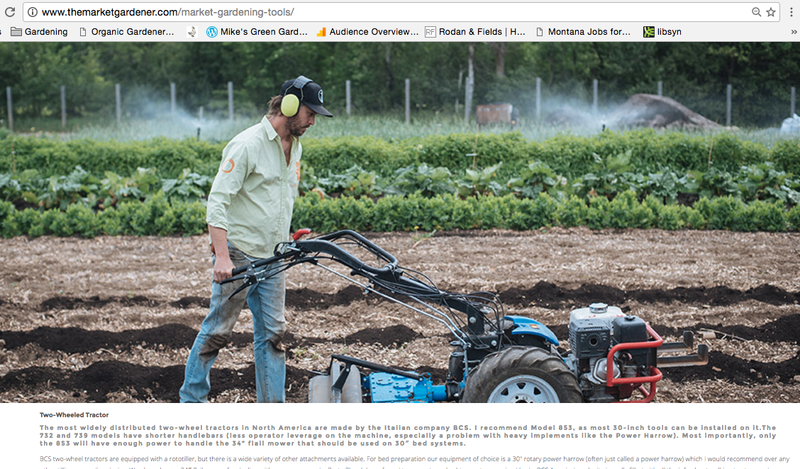 I am going to encourage listeners if they have not seen a broadfork, to go to your website, and look because I had heard about it but until, I went to the seed fair last year and saw one. There are so many super cool videos on your website and I was watching Curtis Stone doing some videos on your youtube channel I learned so much and I loved the little insect hotel! I grew up in the suburbs, a typical teenager, skateboarding, snowboarding… my parents were not hippies … my parents were not farmers.. my father had a small garden but I don’t remember it being so important. He did have a garden. But my first memory of the garden was in the garage there were some shelves that had these bottles, there were some bottles in them with bones and it was like extreme danger! This was the pesticide cabinet, and as a young guy, I was really curious about the pesticide cabinet. That was one of my first memories as a gardener…. It’s funny that I grew up thinking this is really nasty stuff… I can’t even imagine why a home gardener would put pesticides in their gardens it’s like when people used to smoke in hospitals and airplanes.. So one of my first memories is …. my father used to grow roses, and tomatoes and he would always take care of the roses… I don’t know that was why I called my daughter Rose. I’m sure if they are listening to your podcast, it’s because they’re frankly quite aware that you should careful about what you eat… if they don’t care about what you eat and if they only care about how much money they make doing it, it is really really easy to spread a lot of nasty stuff on it, and not have anyone know about it. My husband just sent me an article yesterday about the pesticides they are putting on wheat and it’s like they are putting it on the wheat right before they’re harvesting because it’s gentler on the machinery? or something like that, ti’s amazing… the people who are listening to my podcast are, when you meet people on an everyday basis… I assume everyone is… I ask them to be on my podcast and they’re like why is that bad? and I’m like well you probably shouldn’t and there are other things you could do…. I met my wife at the University we were studying ecology and the environment and we were studying… I don’t want to say gloom and doom but we we’re looking at how the all these other systems were being replaced by deforestation and and all these other problems and we were frankly… after 3 years, we were like we need to do something that is gonna help the world … I still feel strongly about that now… we were looking for how should we do that? Well do you want to tell us more about that? About your book and what you are doing to optimize production? able to generate good incomes ever since! 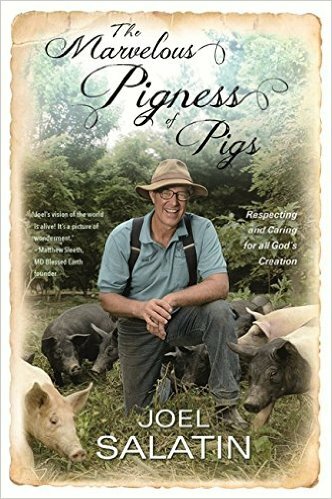 I hadn’t heard a lot of the things in your book… it really helped to watch te videos is there a seeder that has a hand drill? goes about ten times faster! They’re all hand tools …simple but quite sophisticated! When your working, growing vegetables for your community and you ahve reservations about it… and you have people tell you , when they are doing their evening prayers before they thank you, that hard work, is really worth it. So hard work is good! It is hard work… looking at your farm is hard work and how big is your farm? And now you are adding animals? I was excited about beets this year! Because I was transplanting them…I had a program where every two weeks I would transplant new beets. I had 3 different colors, 3 different beets! Then we would go out and transplant these beets and we would get really nice round for sure guaranteed… for 25 weeks… it was awesome! It’s funny how beets they are making a comeback! One crop that is followed, that is followed by another and by another… so even in our northern climate 3 crops per year …. something is going to be planted … maybe I have salads, that are there…. boom boom boom, next day I am planting baby beets So that is 3 weeks that it has to be inside the nursery is like 3 weeks that I gain on my season!!! I’m gonna broadfork the bed, make sure there is deep loose soil about ten inch. That’s what the broadfork will do. a power harrow BCS or a wheel hoe to incorporate all of that! But what I am going to do is I am going to leave 1” of compost on the top and not mix it into the soil. So all of my beds will be covered by 1′ of compost. The compost we use is compost we buy from compost geeks that have big machines and turners. It could come from a municipality. It’s compost that doesn’t have weed seed because it was well composted and it was brought to the right temp and it was turned at the right time. turned at the right time. Do it doesn’t have any weed seed, put one inch layer and then I’m gonna seed over that! I am guaranteed almost I won’t have weeds coming up from the ground because there is a layer of organic mulch ~ the compost that is providing the layer! The trick to get that to work is to make sure that you’re watering at least 3 times a day for 10-15 minutes! Making sure your bed always stays moist. Wow! That’s awesome and I wonder if my listeners heads are spinning if that could be a business making compost? That’s one thing we struggle here with in Montana is fertile soil. I just talked to a guy in Michigan who said there is lots of good soil there… I get frustrated because at the school I work at the kids throw so much away and I want to just recycle all that compost. I’m like your throwing gold in the trash but I’m getting there figuring exactly how to propose it properly! Weed free carrots people are gonna like that idea! I have a lot of these tricks! One of the things I read about was by planting the things close enough together they create like a canopy over the soil it prevents weeds. That is the biointensive techniques that we are using. That’s one reason we don’t use a roto-tiller, because when you use a roto-tiller, you assume that our creating perfecting conditions you have full tilth, you can stick the whole hand into it, especially men really like to till, they have this impression, thing are happening, we are producing good ground! But what happens all the conglomerates and your soil structure is bound together, you pulverize the conglomerates. it into finer particles because of the tilling… it’s like putting something in the blender…. zzzz. At first glance everything, but a week or 2 later, your soil starts to compress… because nothing holding it together anymore …. earthworms and spiders and critters do the work for you because you are destroying their habitats overtime! 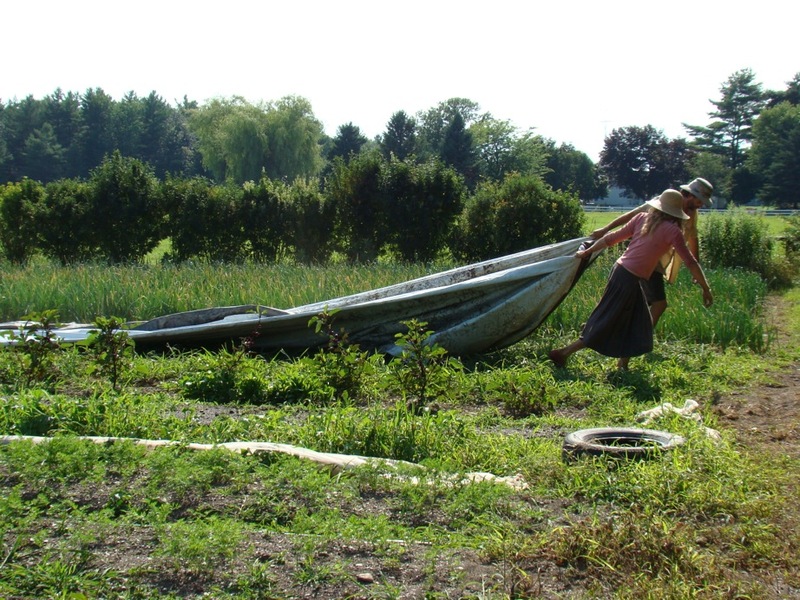 We’ve moving away the tiller and we have developed all sorts of tools that allow us to cultivate the first inch, and tools like the broad fork that go deeper without disturbing the ecology. and the earth worms. Follow the path of the earth worm and you will be successful. I like that, the questions that is in my head, I just keep thinking is if you are planting them closer together are you not going to stunt the growth? The answer to that question has to do with soil structure if you have soil that has layers or hard pan…. the root system of a crop will always look for the path of least resistance. As soon as it hits something that is hard going down, it is going to grow sideways. So if you are ganging all of your crops together really close and you don’t have really loose soil. You will have crops that will compete with each other for nutrients and water. That’s why the broad fork is so important when we are talking about biologically dependents systems and that’s why we cant’ be using a roto-tiller for such things. Make sense? It’s makes sense, it makes a lot of sense to me, my husband and I met planting trees on the forest and the USFS would have inspectors go around and inspect the units, and they would go around and dig up the trees and inspect the roots trying to get the hoe dad down in the rocky soil was hard but if you had too many j roots they would make you replant it! my neighbor has a mechanical, he’s so much more effiecint then me at gorwing potatoes bu thtis year I tried! I was expecting big things! And got a pretty small harvest …. they were good, … nothing spectacular … what should I do, … not only get an abundance of potatoes but also super healthy and incredible,. I need to learn how to do that! Let’s Get to the Root of Things! Maybe in the business part of it? I hate accounting, all the admin stuff, all the paperwork, especially from government and they ask me to fill this form and that form. Everything that doesn’t generate revenues or production, I HATE! When they ask me to talk about what we did and blah, blah, blah … I’m like no, I’m doing this now and tomorrow. Some people really like sitting down, and doing the accounting. I’m not a big fan or that. I’m not too good with getting back with emails…. too much of them and not bothered! When I can be not bothered for like 2-3 hours…. wow! I really like cultivating with the hoes in the garden, I really like setting out the plants and preparing the seed beds all neat and all good. because we have so many customers. We’re counting cash, telling stories, and putting veggies in a box. It’s just very dynamic! It’s good! That’s when we’re changing the system and we’re converting what we do is going into someones house. Everything we’re doing a week! Like when you’re a tree planter, there were people planting a lot more trees in the same time in the same landscape. I’ve been reading your book again. I’ve been thinking about what would be a good challenge, maybe it would be good to go to the Farmer’s Market …. Yes it’s good to go to the market even if you only make $100. We need to replace masses production with production by the masses! most of your listeners know who Eliot Coleman is. I’ve probably read it 50 times when I was young because I was really trying to figure out what I was doing. It was a real inspiration for me probably laid out everything I’ve been doing, I’ve been following in Elliot’s footsteps. I just believe if you want to be successful, you have to follow people who are doing it successfully. 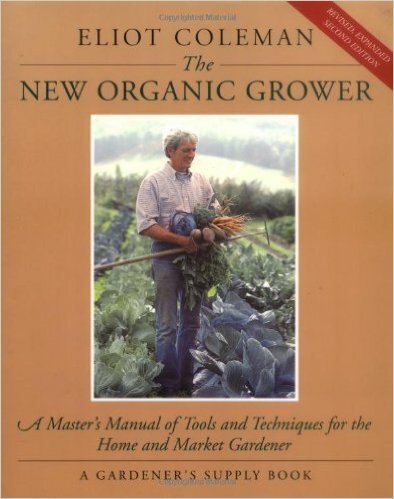 I would say that reading the New Organic Grower. I remember the person, that was like 17 years ago. His name was Norbert, he was a German guy. He was a handyman going from farm-to farm. He was like read! 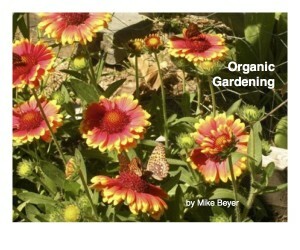 Read the ORganic Grower! You can totally promote your book over and over! All my listeners recommend a book and that was one of the first one’s we got. He just poured over it. Our big thing we just got water. 2 years ago we dug a real well. That’s part of why we haven’t tried to sell antyhing. I see that ou recommend Lynn Byzynskis’s aI want to be the floer farmer, It hoguth growing 750 sunflowers was a lot, and waht I decided is I’m gonna gorow them for birdseed what I really want to do is paint the flowers! 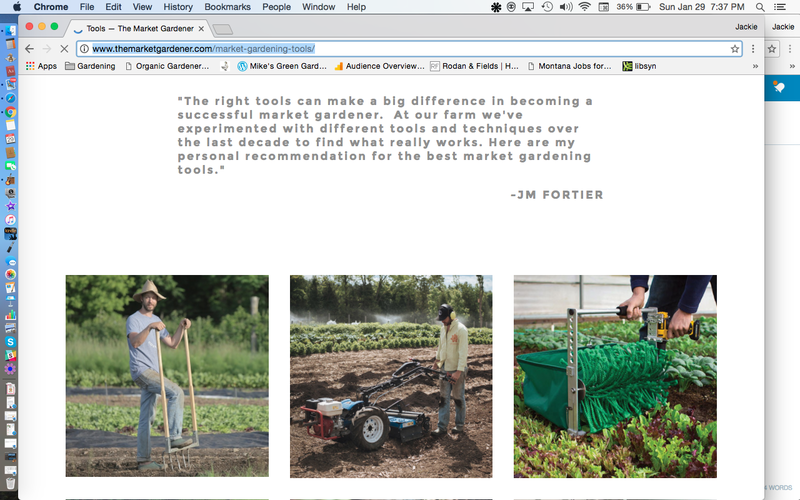 I kind of like, you know I did a dvd… called the market farmer’s toolbox and tool kit. We filmed 2 hours of all the tools that I use, and how I use them. I like the way you talk in the book, which ones to invest in first and which ones are best it’s better to get new and what you can save by getting an older one and which it’s better to buy right away or asap! 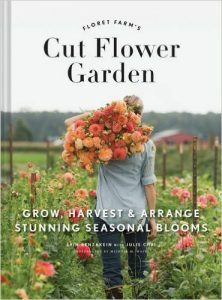 There’s a book on flowers that is coming out March. By ERIN BENZAKEIN… Floret Farms cut flower garden. 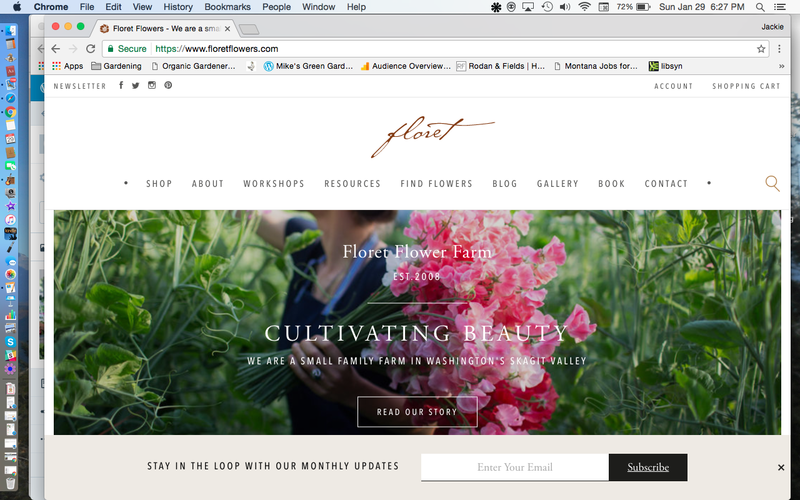 She runs Floret Farms… that’s gonna be a game changer with regards to cut flowers. It’s an awesome book! I’ve read it, because they asked me to write a blurb about it… I learned so much. 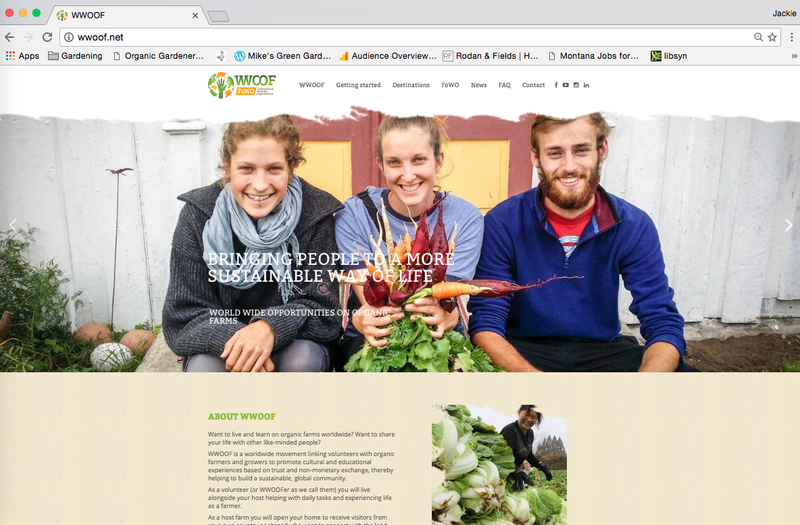 I love Erin’s website… She’s an awesome awesome flower grower! Yep! Finger’s crossed she’s gonna do an interview with me. I talked to her assistant and she hadn’t nailed down a date yet, but I think she said the book will come out in March. When you do talk to her tell her I say hi and I recommend it! I had a guest Julio Freitas. He’s close to me down in Bozeman, I have a friend who actually sold them some aprons. I’ve been following her blog for a while! Are you adding flowers now to your CSA? Yes, and no, I’m kind of playing around with it… I have a friend her name is Cloe and I look at everything she’s doing and I understand there is a next level, I don’t like doing things half-assed, I am going to wait til I plunge into that and learn how to do it well. I think that’s great advice. The guy who runs my podcast. You say a lot of what he says… Like he has this acronym for FOCUS – Follow One Course Until Success, niche down, and stay with what your doing well before moving on and then he also believes in mentors and always says find someone successful and follow them like what you said on Eliot coleman. Do you have a favorite recipe you like to cook from the garden? I love salad greens! I like eating them, I like looking, and I like mesculin mixes and all of that! Sometimes, when I’m traveling, because there all these good eateries. Sometime I’ll order something without any vegetables, becuase I’m so disappointed, sometimes becuase I eat the best veggies in the world, and freshly harvested so when I’m served soething that is not as great so I’m a snob now. iI went to Paris for the first time last year, and I fell in love with mini arugula salad…. I grew some more some last summer, that’s one of the things I’m gonna focus on I always tell people, I’m part rabbit I was a rabbit in a past life. You can have up to 12 rows of that arugala. iWell I’ll talke all the suggestions I can get. Last year, I planted a small round tub. Maybe other listeners who are growing. You aid your first year, you were deteremined to do 30 CSA shares, his goal has alawys been just to grow enoguh food for the two of us, that’s gonna be his full time job, he’s gonn afocus on the garden. If he grows it, I’ll commit to growing to market. I did have a guest on talk about what makes a good CSA customer, and I would not make a good CSA customer because I HATE doing anything on a regular basis, like having to commit to being at the farmers market no matter what? IDK that will be hard for me. Especially when I teach and have to commit to anything during summer vacation is hard! there’s a lot of people out there giving opinions on things they don’t know about. IDK what to answer, I’ve been disconnected. I started, there’s a Facebook group, I think there are about 700 people in that group. That’s been interesting … people posting pictures, there’s a lot of people in the group so there’s a lot of feedback. I love Facebook … there’s another one you might like that’s an insect identification group, there was one in your book that you said you were getting an email about insects that were in the area. That’s the extension agent… they have all sorts of scouters that are out there reporting on where the insects are at, different areas and regions… in the email they give you solutions…. 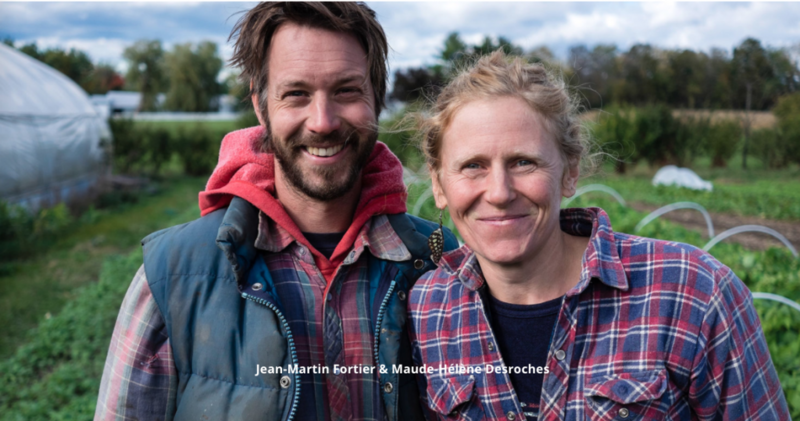 but that’s in French … for growers in Quebec… I’m sure you have something like that in Montana if not maybe people will think about starting something like that. Market Gardener: A successful Grower’s Handbook for Small Scale Organic Farming The Market Gardener! 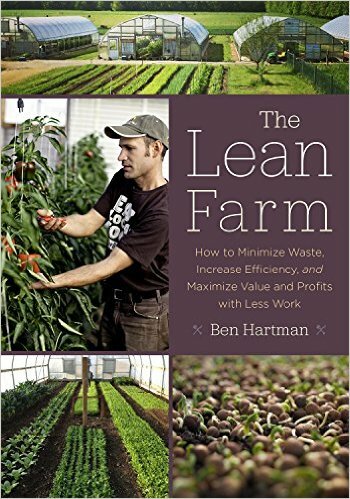 he describes all the steps on his farm… he was influenced by lean management strategies which comes from Japan… looking at the motions of everything you do and trying to find short cuts to optimize look at the processes…. Ben Hartman’s book is probably the one I enjoyed the most! This might be personal, but I’ve had about 100 people come … awesome beautifiul people. I’ve had amazing people! You probably also have people like me who maybe are not intending to be not so awesome, but last year I weeded this bed, and my husband was like you pulled p all the echinacea’s I planted you! that’s the kind of thing that happens that people that are not experienced… the time it takes me to teach 2 people, I could do the work I could do the work of 4 people in that time… what helps me is when I don’t need to be doing it … Im taking people on Im showing them .. give them leeway, I circle back. I need to make sure that it’s done how I want it, then as they learn I give more leeway, …. circle back every month and every year. I know a lot of people…. Do you get a lot of visitors? I am very thankful… everyday… there’s someone … these are all super happy people that have been touched by my work, but you know sometimes …. we’re eating dinner… we’re gonna have open days… if people are interested they should come on the open days. 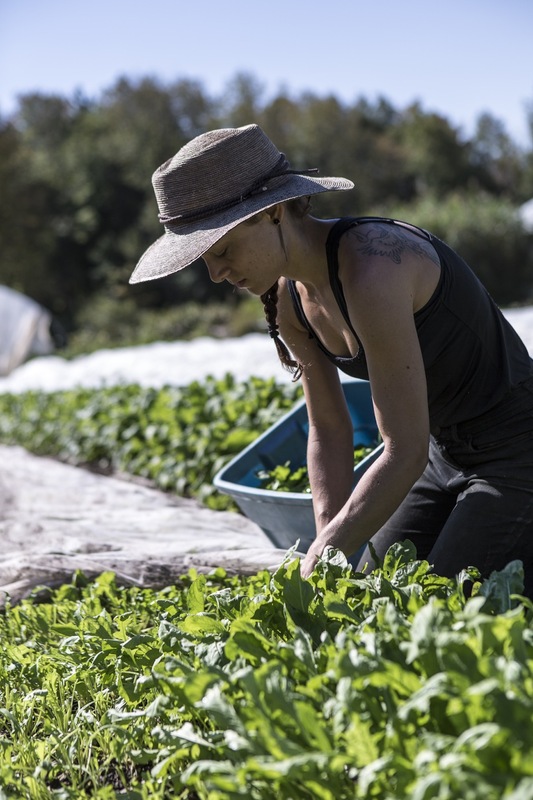 I think we have a broken food system that creates environmental disasters everhwere it is going and created food that is not traditional anymore and we need to replace that with hoards of young people starting farms. That’s my cause. If your listeners want to to support that go to the farmers market it’s hard for them! people are used to not paying a lot for what they eat. The young farmer coalitions out there have all my support and I hope some of their listeners support that and the change that we want to see that. Replacing mass production by production by the masses… and providing good quality of life by people living on the farm. That’s really what we need to see what happened. How to connect with you. Do you want to tell listeners? Your on a tour right now? Where people could here you in person. If they go to my website, I’m not giving too many talks because I do have 2 young kids and I want to be with them as much as I can. Are you going to Italy? I’m also going to Italy! If people want to come here me out in Italy, I hear they have great pasta. I’m thinking there might be a guy form Montana there. There’s a guy Bob Quinn who grows Kamut wheat here in Montana maybe he’s going? I would love to go to Montana! Last year we had a seed fair and it was super popular. We had 500 people through the door before it even started and over 1600 people total! All sorts of things they might be interested in. I am inviting all the home gardeners to be happy super cool to be growing food. If they don’t have enough in their garden they can go out and support local growers! I'm an artist and educator. 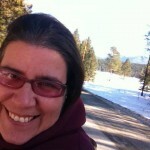 I live at the "Organic Oasis" with my husband Mike where we practice earth friendly techniques in our garden nestled in the mountains of Montana.